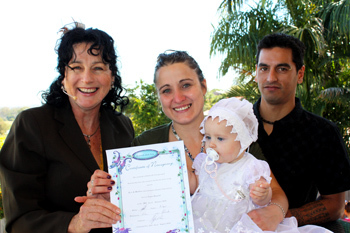 BABY NAMING MARRY ME MARILYN BEST CELEBRANT WITH THE "WOW" FACTOR! 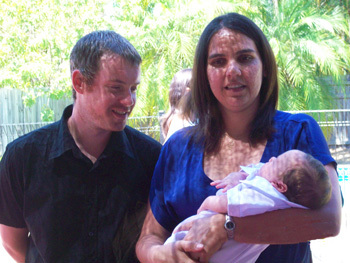 The first moment we met Marilyn we felt she was the celebrant for Keaorah's Naming Ceremony. 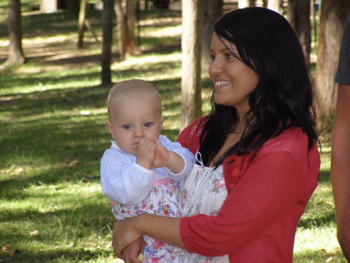 We found her so friendly and approachable and she gave us plenty of ideas to think about. We came away full of enthusiasm and with a basic plan for the day. We decided on a service which would include the four main elements (fire, wind, water & earth) and to make it more personal we would have family members present the different elements to Keaorah. Marilyn was always easy to contact & prompt to replying to any of our changes/inclusions that we had made. The big day was here & Marilyn arrived with plenty of time to help with our last minute preparations & to familiarise herself with Keaorah's families. 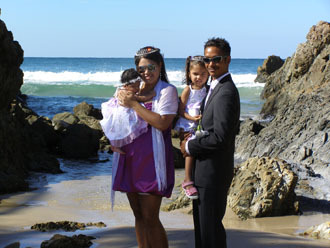 She had made a special effort to get to know Keaorah's large families which shone through in her very intimate ceremony. When Marilyn started the ceremony we all felt she was part of our family & it allowed extra family members to feel comfortable enough to contribute to Keaorah's day. Keaorah's Great Grandmother read her a poem, her Great Aunt welcomed her, her Great Uncle sang her a song in Maori & all godparents blessed her for the future. 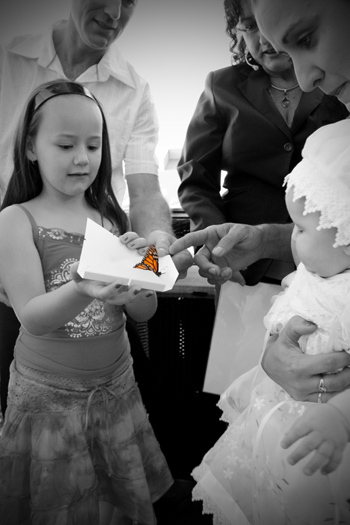 We finished Keaorah's Naming Ceremony by having her cousins release butterflies to wish her a beautiful life and welcome her as Keaorah Jean Low. 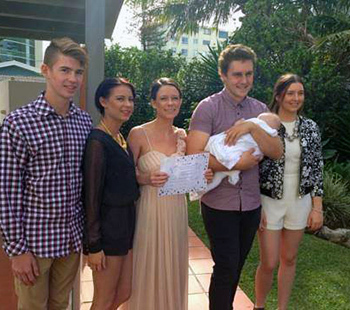 Everyone was so touched by Marilyn's ceremony there was hardly a dry eye in the house. Afterwards everyone knew that when we have our next ceremony we will definitely be giving Marilyn a call & we all recommend her to anyone looking for a celebrant. It's now nearly 6 months on & we still have people talking about how it was such a beautiful, suited ceremony. Our day wouldn't have been so relaxed if it wasn't for Marilyn's meticulous planning, devotion & professionalism. 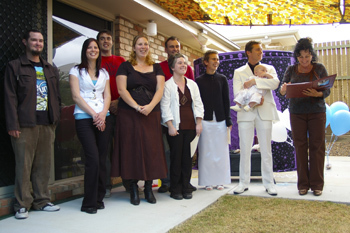 I just want to thank Marilyn so very much for giving us such an unforgettable Naming Ceremony for Keaorah Jean Low. 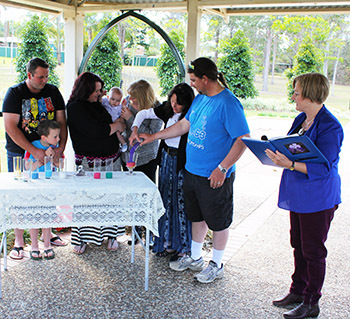 Marilyn used Neroli an Orange Blossom Essential Oil at the Naming of Keaorah & they had a Butterfly Release. We found Marilyn’s ideas for the naming ceremony ideal. 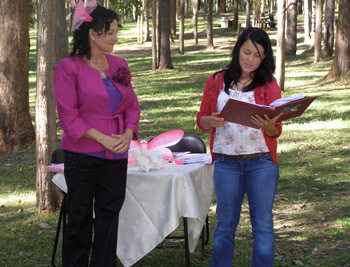 She was completely open to any ideas and changes we had and helped to shape our thoughts to create the perfect ceremony. She was open, honest, easy to talk to and mixed well with all of our family. She added all those little extra touches that take it from just another ceremony to something memorable for us and our family. Thanks again for everything Marilyn. Julie, Barry, Cody, Jess and especially Little Eli. 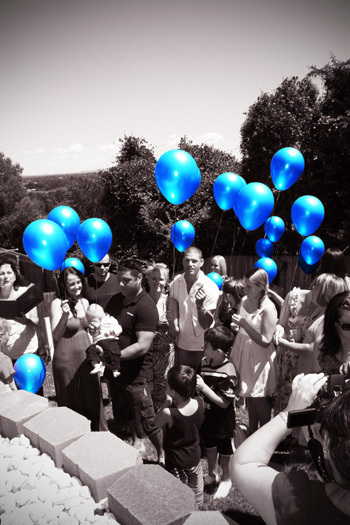 At the very end of the ceremony Carlie & Lloyd had a balloon release for each of the guests that attended so everyone could make one wish for Zaide on his journey through life. 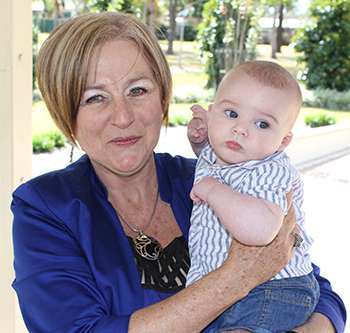 Marilyn Holds Jaxon during his Naming Day Butterfly Release at the Gold Coast Botanical Gardens. His Dad Daniel is holding the butterfly on his hand for Jaxon to whisper his wishes. When I first rang Marilyn to enquire about a baby naming for our son Jaxon she made such a great first impression on me. 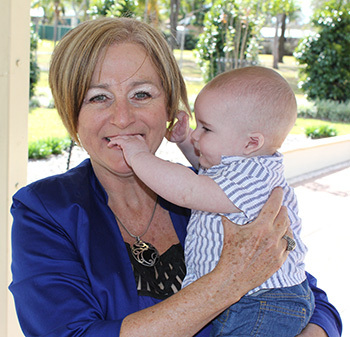 We chose Marilyn, as our baby naming celebrant, because she knew everything right to do, to make it a perfect day for our ‘lil’ man Jaxon. 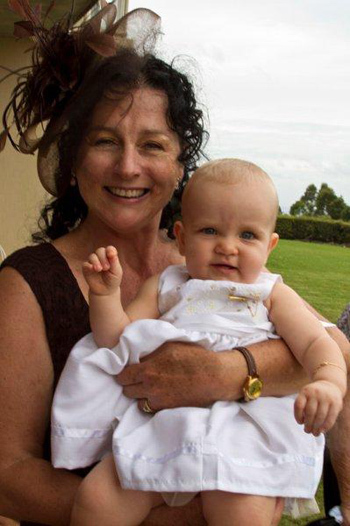 We had the perfect Baby Naming Ceremony at Arundel Hills Country Club, made all the more special with Marilyn’s help. 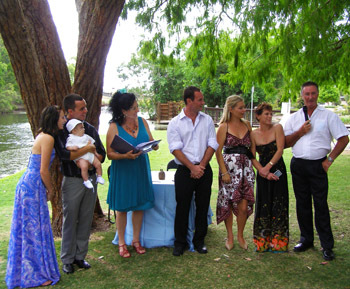 All our friends and family loved the ceremony; Marilyn made the group all feel included. Marilyn was excellent in her delivering the ceremony. We found Marilyn very warm and accommodating, even when we changed a few things close to the ceremony. 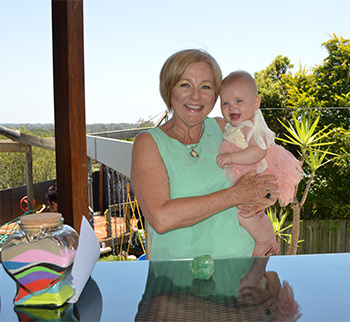 We had a friendly meeting with Marilyn and she listened to exactly everything we talked about, putting together a perfect Naming Ceremony including 2 poems which we wanted added. Thank you Marilyn for making Ellynie’s Day so special. 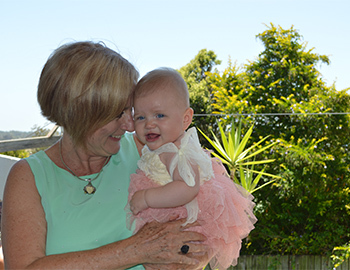 We would definitely recommend Marilyn to anyone who wants a wonderful Naming Day. 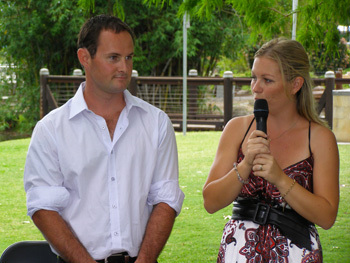 Love Ashley, Jeremy & Ellynie Arundel Gold Coast. Hi Marilyn, Thank you so much for a beautiful ceremony yesterday. 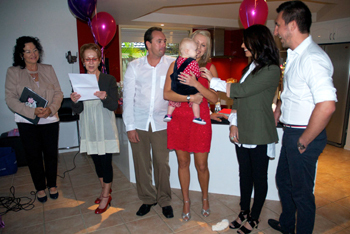 Alexander's Naming Ceremony was beautiful, we all enjoyed it so much and everyone present commented how lovely it was! Thank you so much! Marry Me Marilyn integrated the Brazilian, Australian and Scottish cultures. It was such an emotional experience when Alexander's Grandparents planted the Brazilian Rainforest Cherry Tree. 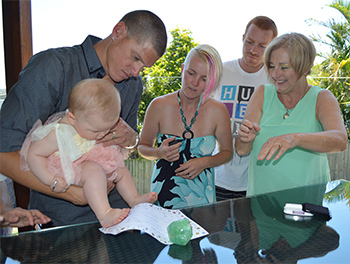 A special part for your naming day ceremony can be for some or all of the guests to speak aloud and dedicate a special flower or crystal representing best wishes or special attributes they bestow on the child to assist them along their journey following special path through life. Apart from the traditional bracelet or piece of jewelry, you may wish to bestow on your child something which has been handed down in the family from one generation to the next or something which symbolises your family heritage. 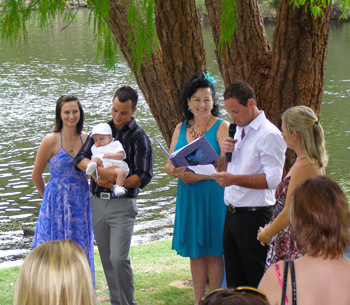 You can combine a Naming Ceremony with a Wedding or Commitment or other ceremony such as Anniversary or Coming of Age Ceremony. 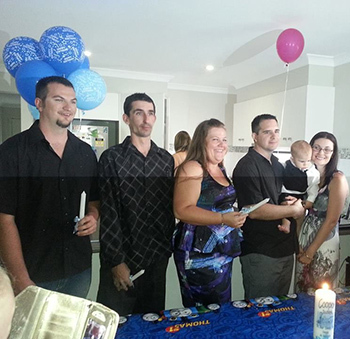 Sharon and Bill asked Marilyn to design a Four Element Ceremony for Baby Eli's Naming Ceremony and a special Life Guide Ceremony to honour and ask all of Eli's six Life Guides to formally accept the role of Eli's Life Guides. 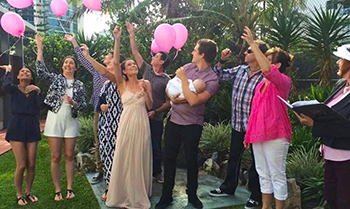 Eli James had an Environmentally Friendly Balloon Release at his Naming Ceremony that took everyone's wishes and blessings to the Universe for him. 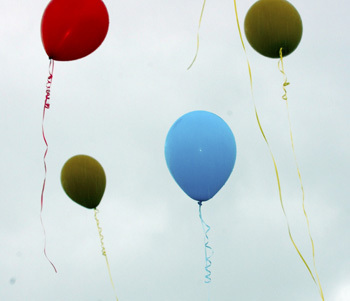 Marilyn talks about the shared responsibilities for Eli of everyone in his life and environmentally safe balloons were released. 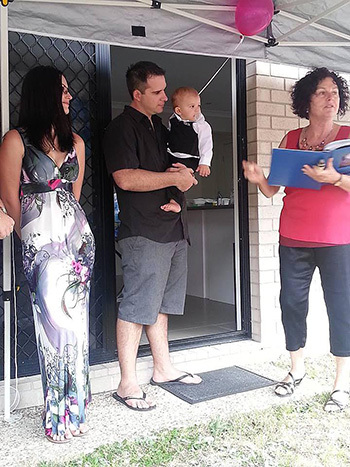 Marilyn Presents Naming Certificate to Eli Sharon and Bill at their home in Warner North Brisbane. 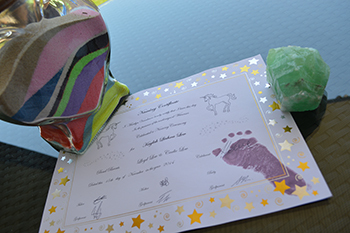 Marilyn also provided a specially designed Naming Certificate for the Life Guides. 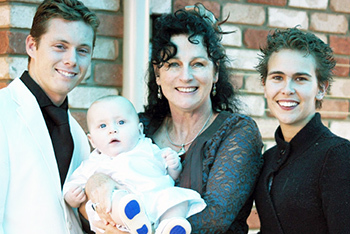 Jaxon's Grandparent's speak about their love for him and the joy at being able to share their lives with Jaxon. 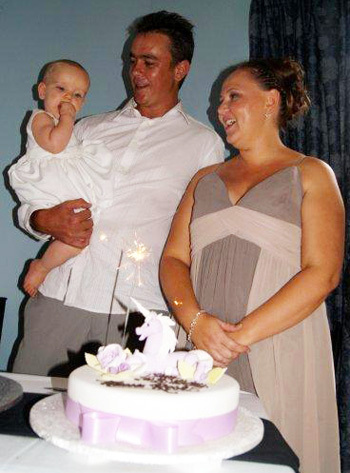 Both Jaxon's Grandmothers were there at his birth to see their little miracle being born! Jaxon released his own Butterfly with a little help from his Dad Daniel. The butterfly is sitting on Daniel's hand and Jaxon lets it go with a wave! 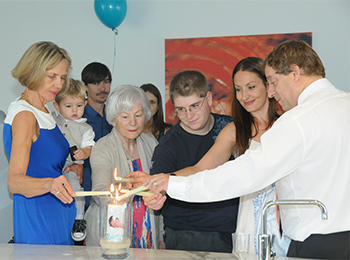 Marilyn wrote an original candle lighting ceremony for Jacob's Naming Day that included his parents Samantha & Jack and his older brothers and grandparents. 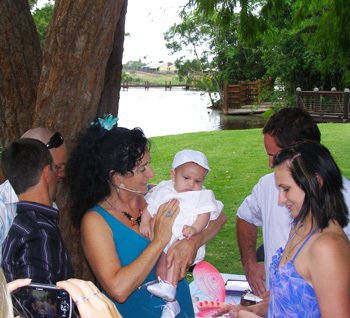 A Naming Ceremony is a civil ceremony held in place of a religious ceremony. 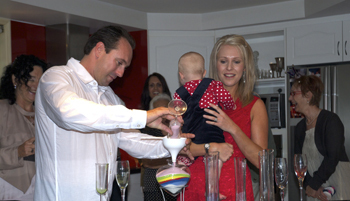 It can be a very special way of celebrating your child's birth and welcoming the baby into the family. It is a time to celebrate the present moment and rejoice in the arrival of a new addition to your family. From the time of conception or knowledge of adoption you have envisioned the personality and future development of your child. Godparents/Guide Parents/Mentors/Life Guides/ Earth-Mothers Earth-Parents or even Fairy Godmother may contribute to the physical, mental emotional and spiritual growth of your child. 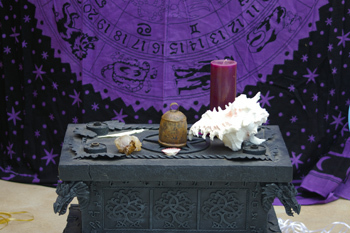 Those appointed to this role are integrated into the ceremony in a beautiful and meaningful way of your choosing. 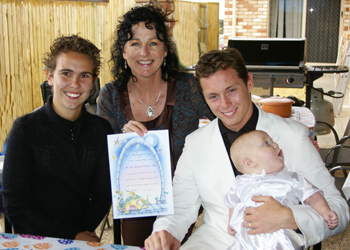 Carlie & Lloyd help their baby son Zaide sign his Naming Certificate with his finger print to conclude his Naming Ceremony with Marry Me Marilyn. Marilyn what can I say you are just amazing. 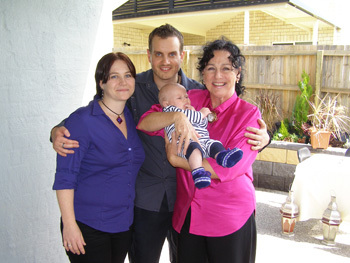 We met you for the first time at our god daughter's naming day held at our place in 2010. 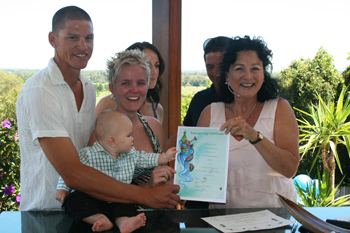 After seeing how well her Four Elements Naming Ceremony went along with her Butterfly Release, I knew that when we had our little bub arrive into this world you were our first choice of celebrant to hold our child's naming ceremony. A year and a half later I got to meet you again but this time to organise a ceremony for our son Zaide. 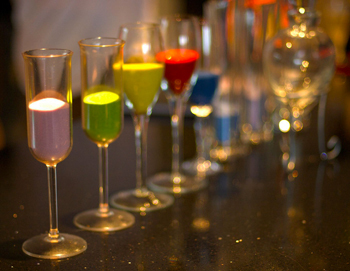 We just loved your creativity and all the different styles of ceremonies you had to choose from. We went with the 7 Angel's Ceremony which you wrote especially for us and I can tell you it was spot on. After the ceremony everyone came up to me and could not stop saying how different it was and how they loved it. We also had healing crystals which each represented the chakras in the body along with Zaide's crystals for his star sign. Zaide added a personal touch to all the certificates with a thumb print. 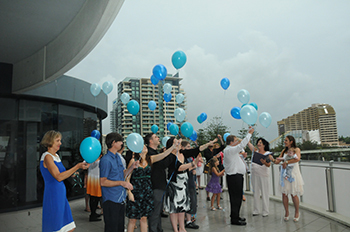 At the very end of the ceremony we did a balloon release for each of the guests that attended so everyone could make one wish for Zaide on his journey through life. We also had the family stand and sing a traditional maori song, Aunties and Uncles read out a poem for Zaide too. Oh and not to mention a list of emails from family members who are interstate and overseas sending their best wishes for Zaide. I thank you majorly for putting up with all my emails, changing things around every second day, well that's what it felt like. You were very prompt with returning calls and emails which is always a big bonus. 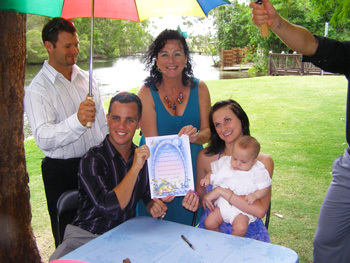 We will definitely be recommending you to anyone of our family and friends if they ever need a celebrant. We can't thank you enough for how special you made this day for us it is definitely never going to be forgotten. Love Always Carlie, Lloyd & Zaide! Welcome to family and friends and acknowledgement of important people who are unable to attend. Special personalised Introduction reflecting you the parents your love, hopes and dreams for your baby and your family and what you love & admire about each other. 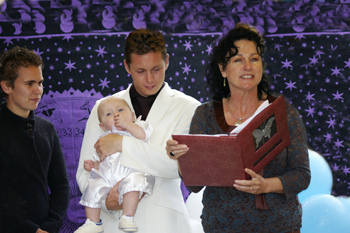 Presentation of the Baby/Child and signing of Certificates by Godparents/Guide Parents/Mentors. 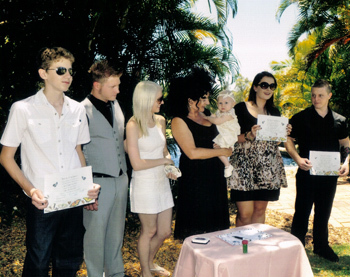 Marilyn designed a special Sand Ceremony for Kylie & Kristian which started in Tiana's Baby Naming Ceremony and was completed at the end of their Wedding Ceremony. 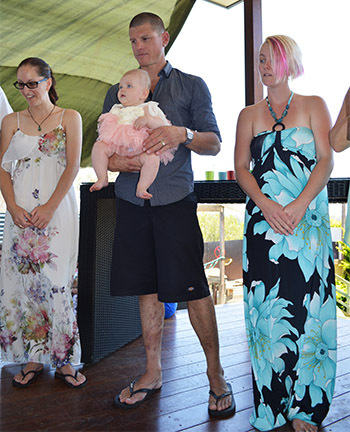 Maddison had a lovely Sand Ceremony at her naming that included all the generations and the Godparents tailored to their family by Marry Me Marilyn. 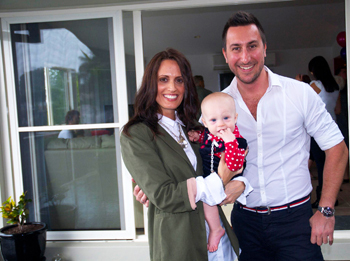 Maddison having a blast and laughing at her own party and naming day. 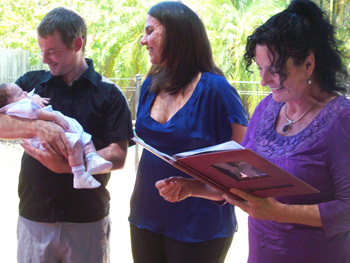 Maddison's Grandmother Oma Annette, as the Dutch say, read a poem dedicated to her and her Godparents stood ready to help & hold Maddison . 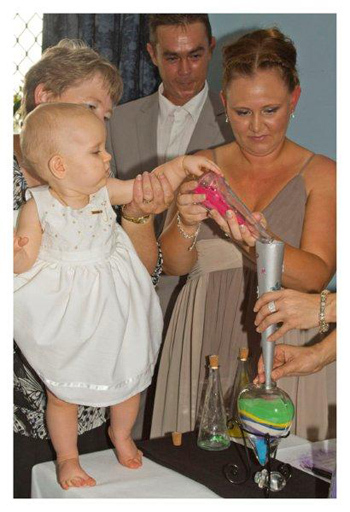 Marry Me Marilyn solved the problem of not having enough vases to pour the sand by suggesting using champagne glasses for Baby Maddison's Sand Ceremony. 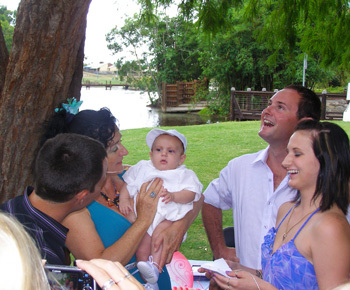 Maddison's Godparents are holding her after the Tree Planting Ceremony. 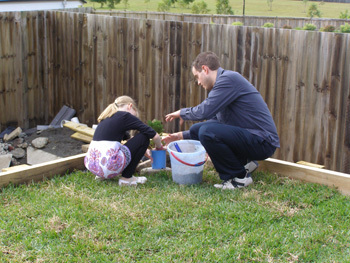 Parents Natasha and Peter selected a special tree especially for Maddison for the Tree Planting Ceremony. The tree was a cutting of Opa's favourite tree - the Jasmin tree. It was planted at one of their homes where they lived. Oma has taken a cutting with her to each place she has lived since so Opa John is always with her and now he will always be with Maddison. If you are living in a rented home or moving house shortly, you can plant your special tree for your baby in a decorative pot at the Naming Ceremony then plant it in the garden of your new home or keep it in the pot until you buy a home or take it with you when you move. From the day we first met Marilyn she was very warm and extremely helpful. 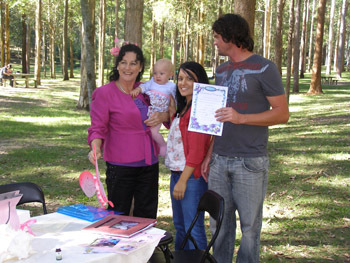 She went above and beyond to create a personal and intimate ceremony for my daughter's naming day. She listened to our ideas and used those to draft a beautiful and magical reading that we will hold in our hearts for a long time. On the day she was friendly and outgoing to all our family and friends. Marilyn spoke really well throughout the reading and there were many positive feedbacks from my family. We will use Marilyn in the future! and recommend others too! Despite the rain on our day (which we believe someone above sent), Marilyn made the day perfect for my little boy Eli. Both sides of the families found it to be original especially with the calling of the four elements. 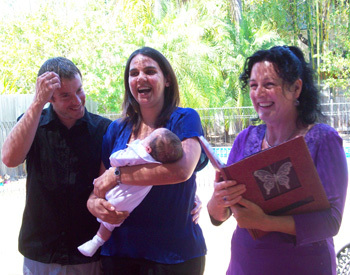 Marilyn gave us all the information and guidance we needed to write our own ideas and feelings and we co-created a naming ceremony that was unique and special. 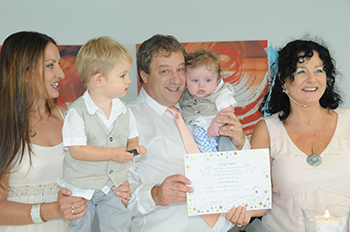 The Naming Ceremony really reflected who we are as a family and celebrated Eli’s unique personality and our hopes, dreams, aspirations and love for him. Marilyn was relaxed and easy to talk to, and was open to all our ideas, normal or strange. She was keen on making sure that this was Eli’s day, and we would like to personally thank her. And if in the near future, when I have more children, I will definitely be choosing her as my naming day celebrant again.And once again thank you so very, very, very, very, very, very much! 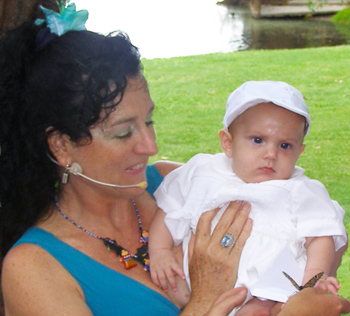 Sharon, William and our Little Eli. 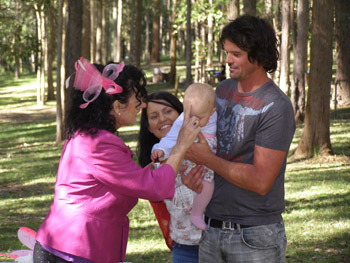 Marilyn blesses Eli James with Neroli Oil at his Naming Ceremony in North Brisbane. Bill holds Eli with proud mother Sharon looking on. Marilyn stands with Sharon and Bill the proud parents and baby Eli. 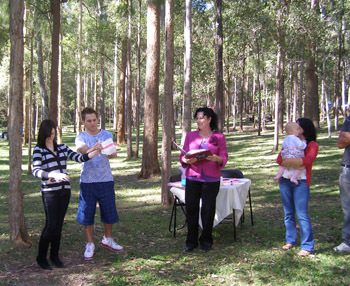 The Life Guides stand ready to pledge themselves to Eli and participate in the Four Element Ceremony and the Balloon Release as Marilyn welcomes family and friends to the Naming Ceremony of Eli James at his parents home in North Brisbane. Lee Jaxon's godfather speaks of his lifetime commitment to him. Lisa Jaxon's godmother speaks of her lifetime commitment to him. For the naming day ceremony, I will invite you to consider your vision for your child, your wishes perhaps that the child carves his or her own life path. I will also incorporate the meaning and significance of their name in a creative way. 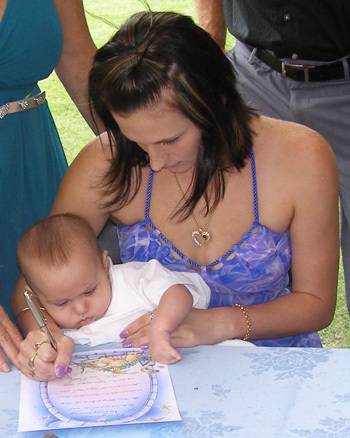 Together with the godparents input you can also decide what role the godparents/mentors will play in the ceremony and what support you want them to provide for your child as they mature. 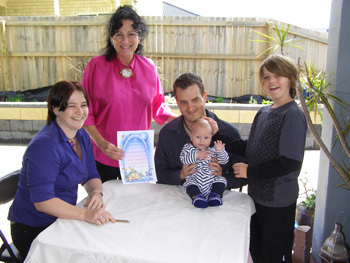 Baby Elijah Aneurin had a Time Capsule incorporated into his Namegiving Ceremony where friends and family put in memorabilia and special messages for Elijah on his Naming Day. 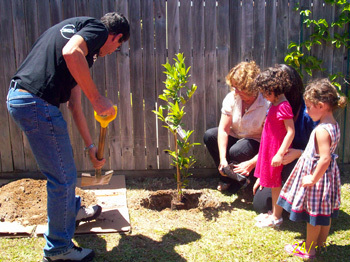 Elijah Aneurin had a Tree Planted in his honour at his home in Warner North Brisbane. The Tree was chosen by his sister Jessie and planted with the help of Father Barry as the highlight of his Namegiving Ceremony. 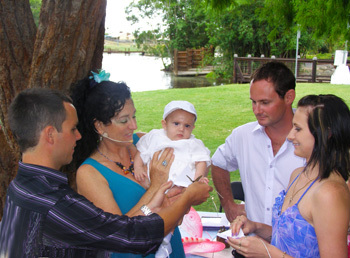 Jaxon parents and godparents watch his butterfly fly away to take his blessings and whisper them to the Great Spirit! 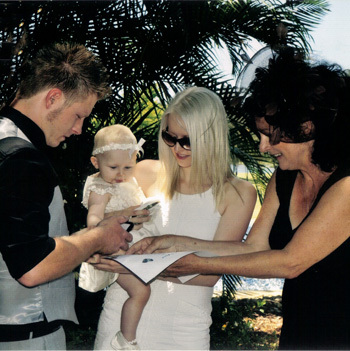 Baby Jaxon signed his own Naming Certificate and Marry Me Marilyn presents his certificate to his proud parents Daniel & Rebecca.